I was so excited to jump into this one because of how much I loved Austenland. Austenland was another of the books I read in that initial "summer of Jane" I told you about (it came after Sanditon, when I'd learned to hope Austen adaptations could be good, and Austenland seemed to confirm that), and I felt like Hale really captured something; it was this perfect slice of what it is to be a die-hard Janeite. I mean, even when you're looking at what's going on and thinking 'This is crazy,' you still sorta want to be there... So I was very eager to start this, and was hoping lightening would strike twice and I'd love this just as much. And then I realized this was going to be a spin on Northanger Abbey. I think this is the deciding factor for most readers - some of you will have just cringed, in which case you may not want to pick this up. Some of you perked up, maybe even said Finally!, in which case, you should go grab a copy soonish. I fall firmly in the latter category. I love Northanger something fierce, and I don't understand why everyone hates on my itty bitty Catherine. I'm not going to let this become a review of Northanger, so I'll just say, to me, NA is Jane at her most fun, and I always say you can practically feel her smiling on the page - it's a book that seems like the author had fun writing, so I have fun reading. So, as I was sitting in a comfy chair on my patio, reading Midnight in Austenland and soaking up the sun*, there came a moment where I started seeing some similarities between Charlotte and Catherine, and I sat up in my comfy chair and said (aloud) "This is f#cking Northanger Abbey!" Anyway, I sat up, excited that it was going to be Northanger, and I think I started reading a little faster. But at the same time, I was hesitant, because the thing is: Charlotte is so much older than Catherine. I know how that sounds, but really - there are things I'll accept in a giddy excitable teenager, just out of her house for the first time and getting to flirt with boys, that I will not accept from a GROWN WOMAN, who in other respects seems to be very level-headed and business minded. What I'm saying is, it was a risk to take on Northanger in a modern setting, with a modern, middle-aged woman. And I don't know that it's a risk that completely worked, honestly. Now, before I delve into the negatives, I want to make it clear that I did really enjoy this. It had the same Janeite drive and touch of whimsy that Austenland did, but it's darker in tone and atmosphere, to suit NA. Reality is starting to intrude on Pembrook Park in a big way, and Charlotte - and the reader - spend much of the time wondering just how dark and real things will get, just how far characters will go. I really liked that the tone mirrors NA and adds that layer, and I liked the realistic feel the darker tone gave the story and atmosphere, where things are supposed to be so fantasized and light. But this walks a very fine line between being a serious mystery and a caricature of one, and until you realize which way the chips are going to fall (whether this is happening or Charlotte is pulling a Catherine), it's hard to decide whether to like Charlotte and go with her, or to think she's a hysterical, high-strung nutjob, looking for drama where there is none. ** I'm not going to spoil it and tell you which is true (sane Charlotte/crazy world or crazy Charlotte/sane world), but I will say that every time I'd think the story was straying too far into crazy town, Hale would remind me that everything actually did make sense. It's hard to explain without giving something away, but basically Hale has this way of seamlessly and judiciously inserting these little reflections and bits of info that make you look at things more from Charlotte's perspective and say, Yeah, maybe she's onto something... and it would always make me giggle a bit - every time I thought I was going to escape Crazytown, Charlotte would pull me back in until I was just in it, saying, Yeah, let's do this! Crazy town banana pants! Ugh, I'm making a mess of this. Basically, it's crazy and it's not; it's dark and intense, and light and fluffy; it's completely what I expected and not what I expected at all... It was a sometimes-strange read that I questioned but thoroughly enjoyed, and even though things have kinda gone pear-shaped at Pembrook, I still want to visit Austenland. So if you liked Northanger or Austenland, read it. If you didn't, don't. **I guess this is the problem people have with Northanger Abbey, come to think of it. But where I normally think "Catherine, you so silly!" I was instead thinking "Charlotte, what the eff is wrong with you, woman?!" I absolutely love Northanger Abbey. It's one of my favorites. I tend to agree - Catherine is such a naive, excitable teen. 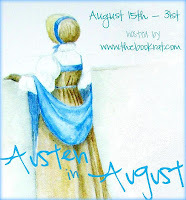 I have read Austenland just a while ago and loooved it. And I love Northanger Abbey. So I´m definitly going to read this sometime! 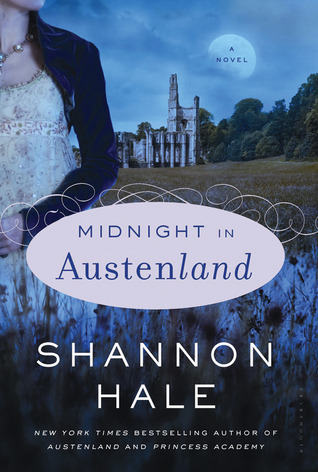 I just impulse purchased Midnight In Austenland on my kindle this weekend. To be honest, your review made me want to read Northanger Abbey more than anything else, even more than Midnight In Austenland, ha ha. Have you read Northanger Abbey before, April? Hahaha, I think I get what you were saying. I read this one too and so it makes sense to me. Anyway, I think some of that caricature vs serious tone came from Northanger, which drifts a bit between real gothic and parody thereof. I'm picking up what you're putting down with this review! You're making sense to me. I read Midnight in Austenland, but I haven't read Northanger Abbey yet. Your review makes me want to read it! I love Northanger Abby and I really loved Austenland so I defiantly need to read this book :)!!! I thought your review made total sense :)! "...you can practically feel her smiling on the page..."
I mean it. I remember the first time I read it, something happened (don't remember what, now), and I remember that I actually stopped and thought, man, I bet she had fun with this. It just seems like a happy book. Like she was having fun. Yet to read Austenland, but I love the cover! Yea, this was a good review on the same frustration I felt. Before buying it I new it was NA so I was all excited. I enjoyed it, but then was weirded out a bit by the woman's actions. But I think that was the difficult thing to grasp because it was a modern adaptation mash-upidy mess. Can't wait to see the movie of the first. Just finished reading mindnight in austenland and I just wanted to post somewhere about it. Loved it. Top 50 books for sure which is a big compliment because I'm old and have read a lot of books! If I could just share my website with your readers, it's at skin tightening - cheers!